"We usually make this bread around Christmas time, but it's good anytime!" Mix together the flour, 2 1/4 cups white sugar, baking powder, salt, milk, 1 1/2 teaspoons vanilla and eggs. Mix in the vegetable oil, poppy seeds, 1 1/2 teaspoons butter flavoring and 1 1/2 teaspoons almond flavoring. Beat with an electric mixer for 1 to 2 minutes. Lightly grease 2 loaf pans or 6 small loaf pans. Bake 45-60 minutes at 350 degrees F (175 degrees C). Cool for 3 minutes and top with the orange glaze. To make Orange Glaze: Mix together 1/4 cup orange juice, 3/4 cup sugar, 1/2 teaspoon vanilla, 1/2 teaspoon butter flavoring and 1/2 teaspoon almond flavoring. 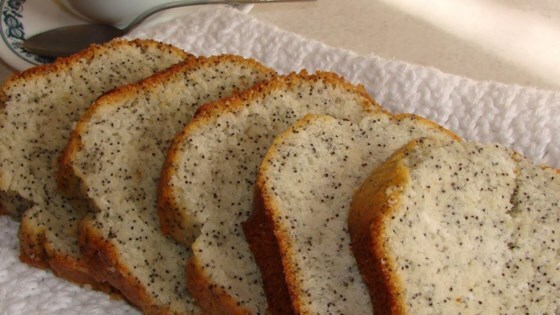 See how to make a sweet poppy-seed bread with almond and orange flavors. My husbands co-workers went crazy for this. Just a hint, if you want the poppy seeds to be soft, soak them in the milk first. I substituted half splenda/half sugar and half applesauce/half oil to make it a bit healthier and it was fantastic! I didn't add the glaze. It didn't need it as it was moist, and sweet! lovely!